Assad regime drops pamphlets telling east Aleppans they can leave; residents cite “publicity stunt” as diapers and toothbrushes rain from the sky. Regime forces strengthened their hold over the Castello Road by driving rebel fighters out of the Beni Zeid district, which lies alongside Castello, and, up until Wednesday, was part of rebel-held east Aleppo. Also on Wednesday, a concurrent YPG assault and victory over a second rebel-held district adjacent to Beni Zeid contributed to the regime’s ability to break through the opposition’s ranks. While the YPG and Syrian regime forces launched an offensive on the same day against two adjoining rebel-held districts, it was not immediately clear to what extent, if at all, the two parties coordinated the campaign. On Tuesday, regime forces moved from “fire cutting” Castello, or holding the road through extreme bombardment, to physically controlling a section of the road, which previously facilitated the movement of food, medicine and other supplies to east Aleppo city’s nearly 300,000 residents. On July 8, regime forces—backed by Iranian militias and Russian air cover—captured several positions overlooking Castello Road. A barrage of, on average, “150 strikes per day—including airstrikes, barrel bombs and artillery rounds” rendered the route inaccessible, a volunteer with the Syrian Civil Defense in east Aleppo told Syria Direct earlier this month. Syrian rebels fire mortars near the Castello Road earlier this month. Photo courtesy of Ammar al-Halabi. “This tragedy will impact the people of Aleppo—our family and relatives—in every aspect of life,” he added. Beni Zeid’s civilians long-since fled after repeated Kurdish attempts to overtake the city, Milad Shahabi, an east Aleppo-based citizen journalist told Syria Direct on Thursday. “There was really no one inside Beni Zeid except for a few rebels,” he added. While rebel fighters reportedly withdrew from Beni Zeid before the regime’s offensive, avoiding heavy losses, the territorial concession makes it even less likely that rebels will reopen the Castello Road. 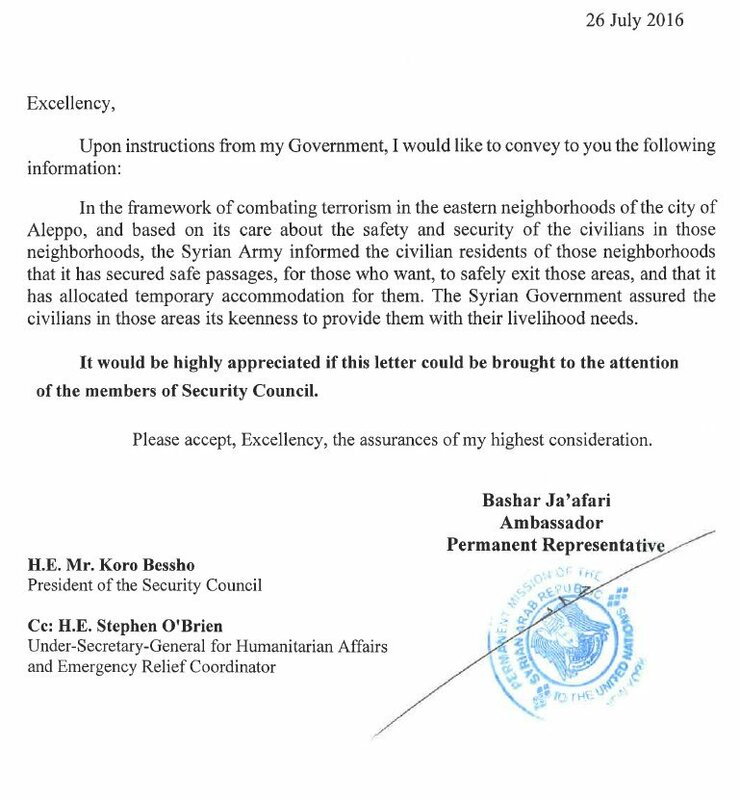 Earlier this month, the UN Office for the Coordination of Humanitarian Affairs warned that in the event of a total blockade of rebel-held Aleppo city, the UN and its partners in the area only “have enough food supplies for 145,000 [civilians] for one month” out of the total city’s population. Helicopters dropped pamphlets over east Aleppo city—one day after at least seven airstrikes—advertising four “safe passages” for any east Aleppo resident looking to leave. Three lead in the direction of the regime-controlled portion of the provincial capital and one towards the regime-held southern countryside. Several sources on the ground told Syria Direct that not one of the four proposed passages is in fact open. A pack of sugar, a single teabag and a small plastic pack of jelly; part of an aid parcel dropped over east Aleppo city. Photo courtesy of Twitter user NorthernStork. “We’ll never leave our city, no matter the dozens of airstrikes nor the continuous bombings that we face,” Murad al-Halabi, an Aleppo resident in the Saladin district, told Syria Direct’s partner website The Syrian Voice. “The Syrian government assured the civilians in those areas its keenness to provide them with their livelihood needs,” he added. Along with the pamphlets, Syrian and Russian helicopters reportedly dropped 1,000 aid parcels over neighborhoods of east Aleppo city. Several Aleppo residents called the food delivery and promises of safe passage “laughable” in interviews with Syria Direct and The Syrian Voice. “The Assad regime and Russia are mocking the people of Aleppo, and they’re looking for propaganda material, hoping that the international community will overlook the destruction and killing that they’ve committed,” said east Aleppo resident Murad al-Halabi. Some residents burned the aid packages out of fear that they were poisoned, Wasim al-Khatib, another Saladin district resident told The Syrian Voice. Russian and regime efforts to downplay the tightening encirclement of east Aleppo represent “little more than an attempt to pull the over the eyes of the international community,” east Aleppo-based human rights activist Mohammed al-Mohammed told the Syrian Voice.